I’m going to start this blog off in a weird way, and I apologize for that, but I think it’s necessary. I need to admit that my spending lately has been a bit out of control. I’m not spending outside our means or anything, but we have been accumulating a lot more stuff than I’d envisioned for our family. Joe and I desire to have a clean, minimalistic home, and bringing more and more things in doesn’t help us toward that vision. I think it’s important to note this, because while we’re actively working toward a simplified life, which you’ll see as this blog grows, I also don’t want to deprive my child because of my own mistakes. So, Evelyn’s Easter Basket this year is a little excessive, but I don’t foresee this being a trend throughout the years. Ideally, I’d like to follow the Want, Need, Wear, Read rule, where children get one thing they want, one thing they need, one thing to wear, and one thing to read. Her Easter basket did start out that way, but then I got a little carried away. So, I’m hoping that if you’re still looking for something to put in an Easter basket, maybe I can give you some ideas! Lindt Chocolate Bunny & Carrots. Yes, I am the type of mom that will give my kid candy every once in a while, and this is one of my non-negotiables for an Easter basket. When I was growing up, we always got a chocolate bunny in our Easter basket, and it’s just not a tradition that I plan to discontinue! Pearl Necklace. Evelyn loves wearing jewelry and dressing up, so I thought it would be fun to make her a little pearl necklace to go with her Easter dress. I picked up all of the supplies from Hobby Lobby, and made it up fairly quickly during one of her “Quiet Times” (a.k.a. naptime!). LEGO BrickHeadz. I need to give Joe all the credit for this idea, since he found and bought it for Evelyn on his own! It’s geared toward older kids, ages 10 and up, but really, who doesn’t love LEGO? Also, since it’s for an older age group, she’ll be spending some quality time with Dad putting it together, too! Rain Boots. Evelyn and I love going outside, and the puddle splashing weather around here has been perfect lately! However, her current rain boots are getting a little snug on her, so she needed a bigger pair. 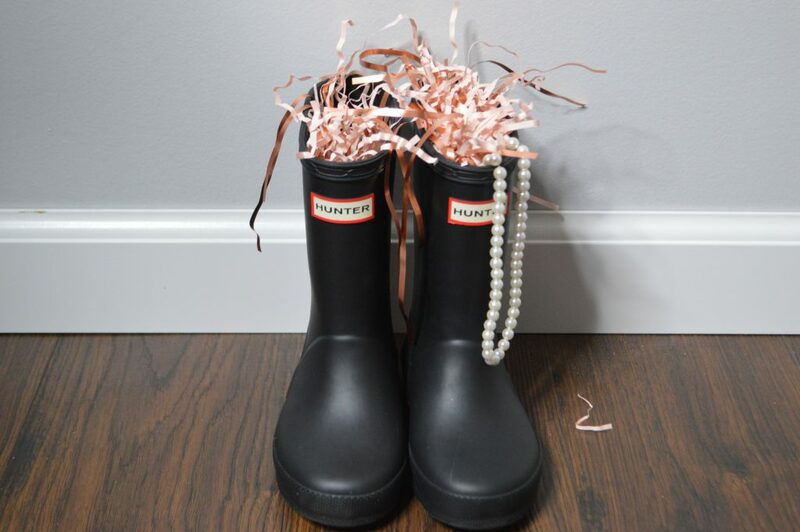 I decided on these Hunter ones so that they would match mine, and so that we can pass them on to her little brother or sister when the time comes. 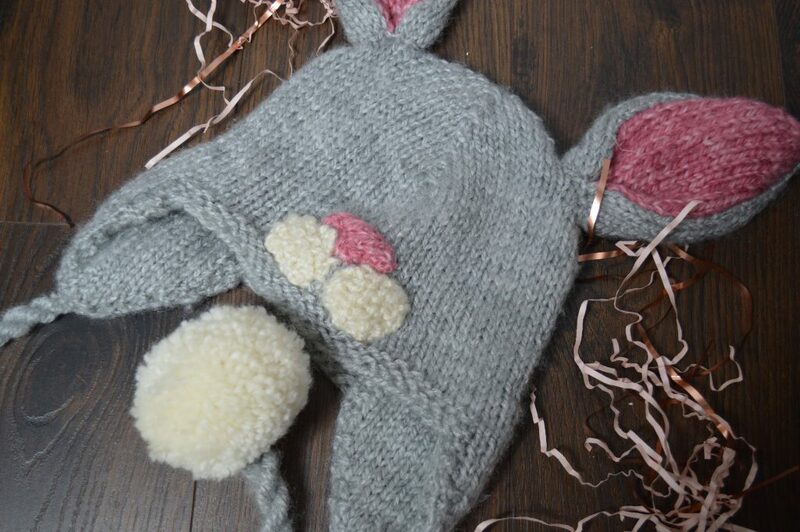 Bunny Hat. You had to know that I was going to have some sort of hand knit item in her basket, didn’t you? I made this from one of the patterns in Vanessa Mooncie’s book, Animal Hats: 15 Patterns to Knit and Show Off quite a while ago (as in, pre-Evelyn), and happened to find it again recently, so into the basket it went! A book. 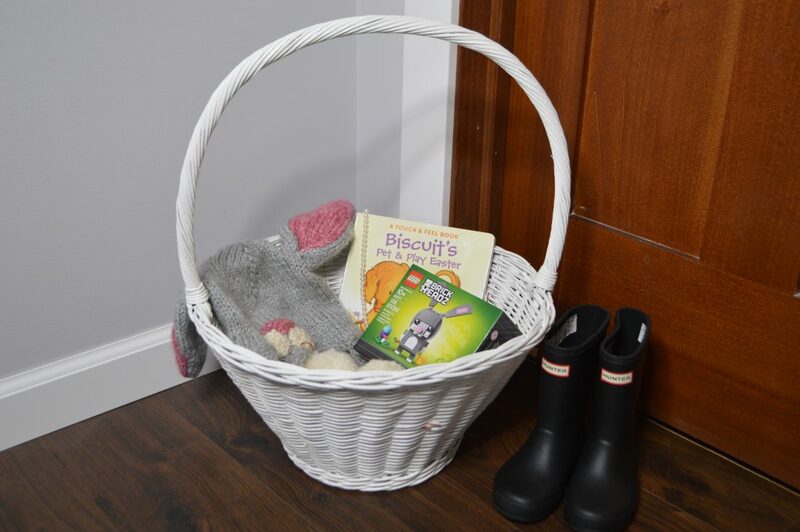 Finally, I picked up Biscuit’s Pet & Play Easter because Evelyn has a touch and feel Biscuit book for both Christmas and Valentine’s Day that she absolutely loves! It seemed like a natural addition to her little library, but any book would work, depending on your child’s interest. There you go! That’s what we put in Evelyn’s Easter basket this year. As I said, I do think her basket is a little excessive, and although I plan on cutting down gifts in the future, I’m really not sure what I would have cut out this time. We did well on Need (Rain Boots), Wear (Bunny Hat), and Read (Biscuit Book), but went a little overboard on the Want. It’s so hard to choose just one thing! 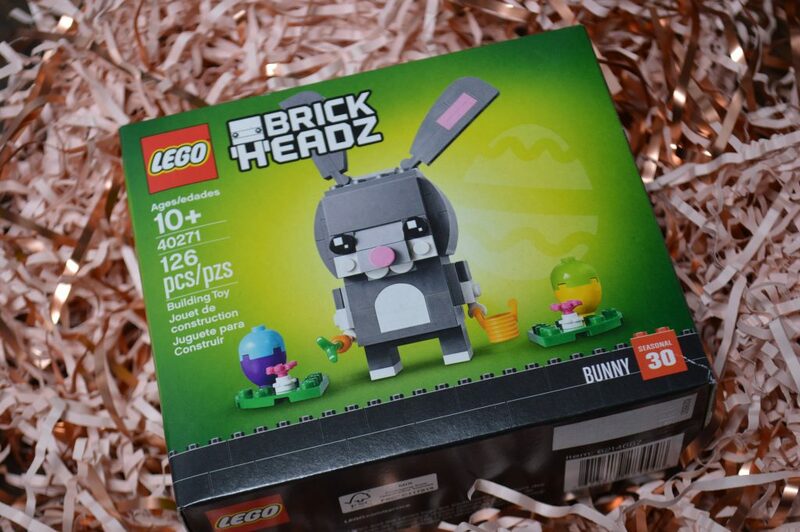 If I were really pressed, I’d probably keep the chocolate bunny in her basket, just because it’s such an iconic part of an Easter basket to me, but I really do love the LEGO and pearl necklace, too!